Description: An eastbound stack train rolls by me just west of Tangier. Description: BNSF 4910 leads the southbound. 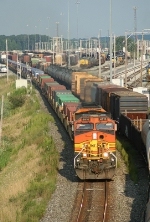 Title: BNSF 4910 leads EB Stack! Description: After waiting for two Westbounds, this vehicle train begins its trek on the single track. Description: Three GE products head lite to Saint Paul as the leader smokes it up a bit as they get up to track speed. Description: An NS leader brings two other GE products onto the main lite powered as they head to Saint Paul Yard. Description: North Yucca Ave., 1213 hours. Description: BNSF Dayton, TX to Galesburg, IL manifest train H-DYTGAL1-08 rolls northward on the BNSF Fort Worth Subdivision at the south end of Manhattan which is between Crawford and Valley Mills - BNSF C44-9W 4910, BNSF AC4400CW 5600, BNSF C44-9W 4957, 84 loads, 14 empties, 11258 tons, 6499 feet with power, ETD BNQ 45691. Description: A first for me, this train was a loaded wet distillers corn train using coal gondolas. Description: BNSF Railway train X-PTNARK1-11A (empty unit grain train, Houston TX to Arkansas City KS) passes through Metro Junction, a few miles north of Krum, Texas. Dash 9-44CW 4910 is the sole power for this train on this bright October 13, 2011 morning. Description: BNSF 4910 (C44-9W) performs DPU duties on a NB oil train in Hoxie AR.